Women’s Health contributor and psychologist Dr. Michelle Callahan appeared as a guest on CBS’s The Early Show discussing a new study that shows women are outpacing men in education and income. 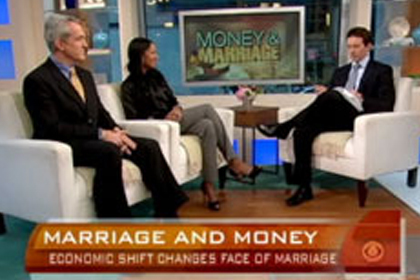 Find out the implications of this economic shift and what it means for marriages. How do I start dating again or be happy alone? Question: I was in a serious relationship that led to me getting totally ripped off by this female and left me in a destitute situation. After two years of depressed states and trying to find good jobs in today’s market, I am finally getting back on my feet. Financially I am still in the red, but am on my way back to stability. I am gun shy about relationships now as well as I feel kind of inadequate due to the fact of my financial status. My question is, “When would be a good time to get back into the dating scene?” I miss having that closeness of a companion, but I am still kind of untrusting. Should I get back into the dating scene or be content with being alone?